Here at Gang Gamer Grean, we bring you a comprehensive coverage of the latest games, gears and anything else related to gaming! Razer has been around for quite a while now and most people probably know them for their quality gaming peripherals. In this edition of Gang Gamer Grean: Razer Review Thailand, we are going to be reviewing the Razer Destructor, designed in cooperation with professional gamers and according to the firm it provides 25% better tracking for gaming-grade optical mice and 37% better tracking for gaming-grade laser mice than other gaming-mousing surfaces. So you just brought yourself a whole new gaming rig, a keyboard, a mouse and a headphone, you installed those onto your computer and try them with the latest games you own, but you still lack the accuracy and tracking. You find yourself on the losing side too often, then you gazed upon your mouse and that piece of cloth that you use your mouse to move upon, known simply as a crappy mouse pad, and then you realized that was that something you overlooked. Have no fear the Razer Destructor is here! The Razer Destructor comes in a stylish black carrying case. 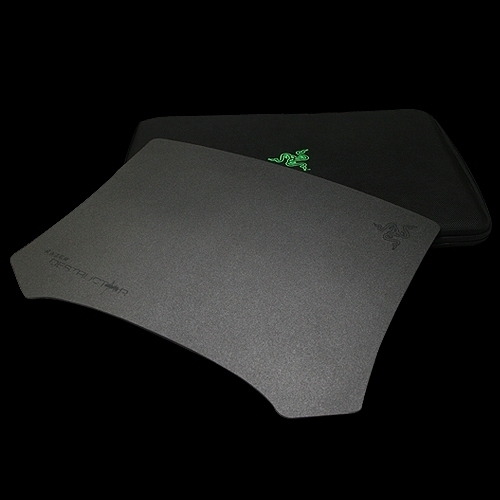 The case features the Razer logo in the middle of the front side. 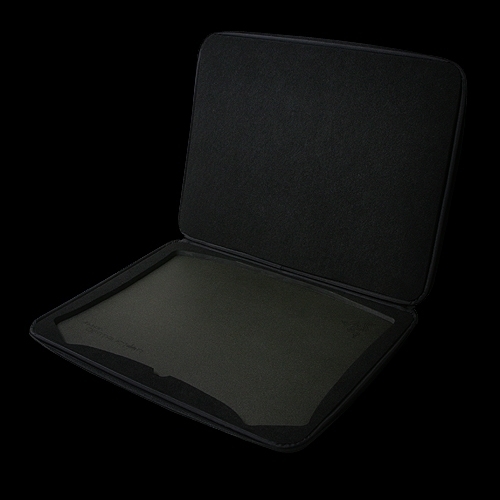 Inside the case, there is padding all over the case portion. The bottom side features a cut out that fits the mat and the mat only, a perfect fit. Soft fabric is used to cover the whole entire interior which helps protect the Destructor. 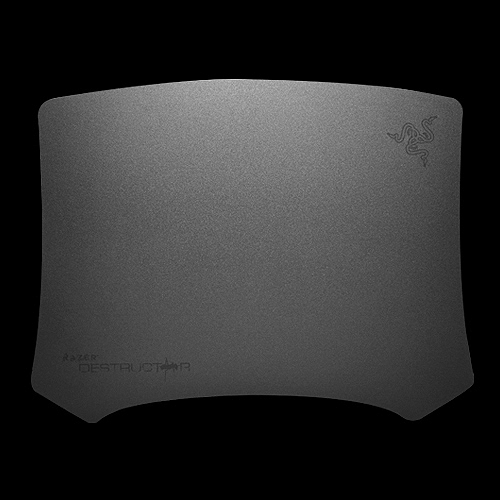 First thing you will notice about the Razer Destructor is that it isn’t the typical boring rectangular shape as seen in many of the mouse pad. The size of the Destructor is a bit oversized, I must say, around 35cm by 30cm, but this does give very sensational long-distanced mouse sweeps. The Razer logo can be seen on the top right corner while the Destructor logo can be seen on the bottom left corner. The rough rubber coating on the bottom of the mat provides grip for anti-slip. The mat is partially flexible but won’t be bending easily. For a hard mat, the Destructor is quite very thin. Rubbing my hand on the surface, feels like a fine sandpaper, the mat colour is actually dark gray, despite the surface is not smooth but all mice tested on the Destructor feels like they’re levitating. Although the Razer Destructor come with a huge price tag, but you are not just buying the mat, you are buying the Razer quality. 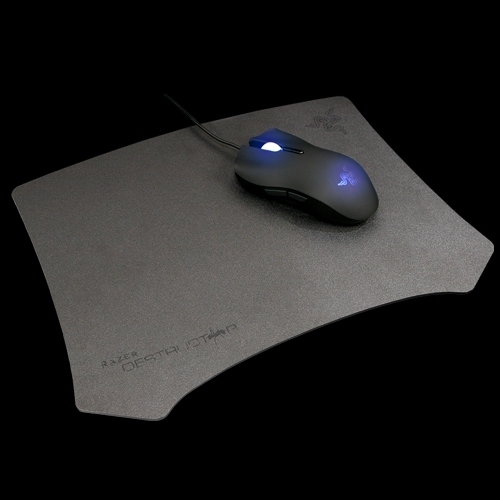 9th minute: Overwhelm by the size of the actual mouse mat, would this fit on my desk? 59th minute Money well spent! Ease of Use - Users may now realize that their table are too small to accommodate the Destructor or is it the other way round? Value - A huge price tag! All games and gadgets reviewed are registered trademarks of their respective companies. This site is not licensed, designed, sponsered, endorsed or manufactured by any company. Copyright © 2011 Gang Gamer Grean™. All Rights Reserved. Awesome Inc. theme. Powered by Blogger.